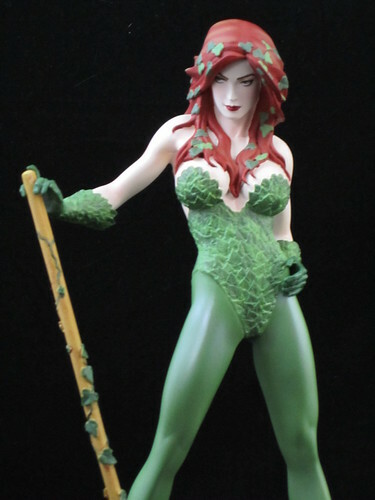 DC Direct gives AFB Poison Ivy, Cover Girls Style! From last night’s review of a Marvel Heroine, we move this evening to look at a DC Villainess, but are staying in the statue realm. You may have noticed my collection is definitely veering more towards statues these days. Trust me, my wallet has noticed as well! Among the many things I had to try to work out after my return to comics after a long hiatus was why Poison Ivy had green skin. I really don’t know if I’ve ever worked the full story behind the change out, but regardless I remain very partial to the original version. 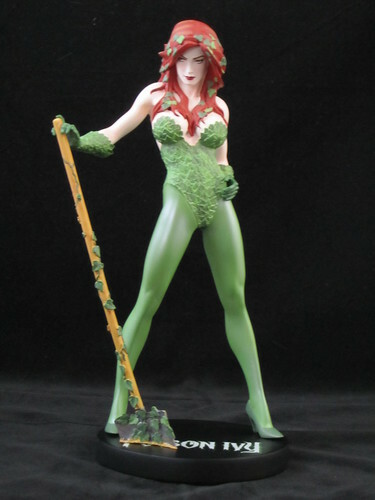 I was really delighted to see that the DC Direct Adam Hughes-designed Cover Girls of the DC Universe Statue based on Poison Ivy would be based on a non-green Ivy. I was enthralled by the Hughes artwork announced as the base for the statue, and couldn’t wait for the final product. I really like the way that DC Direct includes the original artwork on the packaging of its statues. These sketches and covers are usually translated beautifully into three dimensions. What can become apparent through these comparisons, however, is that it’s often difficult to capture that little spark of magic that artists imbue in their original work when converting to statue form. There’s a little element of expression in Hughes ‘ Ivy, a coquette-ish knowing in her eyes, that doesn’t quite come across, but it’s a small niggle. On the design side, I really like the way Hughes sketched Ivy’s hair, and that element is a tad different in the final piece. Small things, but worth noting as a part of commenting on the translation process. The statue comes in three pieces – Ivy herself, her base and her ivy-covered spade. I had a moment’s trouble getting Ivy’s feet pegs into the holes on the base. There was a slight amount of pressure required to bring her legs close together enough to get everything in place (a sentence which I realise would be quite concerning if taken out of context…) and my fear of breaking something when putting statues together is always heightened, but in the end there was no issue. The placement of her spade is a nice design, as it has a little pin at the tip of the spade which fits into its own small hole on the base. The spade is small and seems fragile so this extra stability is a big plus. There is a fair amount of detail and very nice textures in this design. The leaf elements on her outfit are sculpted, not just painted, and there are small leaf details throughout her hair. The leaves encircling her spade are also sculpted and are beautifully done. Even the "Poison Ivy" logo on the base has texture to it! There are matte paints used which is a nice contrast to a few of the other Cover Girls pieces like Harley Quinn and Catwoman which have large high gloss elements. Unfortunately, there is a less than small QC issue with this piece, and that is a rather poor paint job in the application of the flesh tones. Surprising coming from DCD who usually have fairly solid paint apps in the statue department, and the first paint issue I’ve had with the Cover Girls Statue line. There is a line of flesh-toned paint that has strayed over onto what should be her hair on the left side of her head and neck, some similar issues with her hair at the back and some fuzziness in the join between her top and her flesh. It is a rather noticeable mistake. I haven’t seen any other versions of this statue in person to know if this is an issue across the board if I was just unlucky. I am sure I will learn to tune this out eventually, but to date it still draws my eye for a moment each time I look at the piece. Paint slop aside, this statue still stands beautifully in line with the Cover Girls set , and I remain delighted that this version of Poison ivy was chosen. I really like this line, and have all except the recently released Batgirl, which I just felt was too out of character with the rest of statues. I’m looking forward to the upcoming Hawkgirl and Starfire editions, and will make a decision on Armoured Wonder Woman when I see it in person. Assuming that the paint issues here are an anomaly, I wish the line a long and fruitful life! You can see more pics at Facebook, discuss this at the AFB Forum and comment on this post to enter the April AFB Comment of the Month Contest! Great review Andy. I agree on all points. Mine has the same paint QC as well. I notice the wings on the upcoming Wonder Woman are the same as those off a DCD Hawkgirl figure. Nice re-use. Great review, excellent pics, wow I wish I could afford to buy all these statues.